A key riddle in cosmology may be answered by the 2012 discovery of the Higgs boson—now a leading contender for the 2013 Nobel Prize in Physics on October 8. Two physicists suggest that the Higgs had a key role in the early universe, producing the observed difference between the number of matter and antimatter particles and determining the density of the mysterious dark matter that makes up five-sixths of the matter in the universe. In a paper accepted for publication in Physical Review Letters, Sean Tulin of the University of Michigan in Ann Arbor and Géraldine Servant of the Catalan Institute for Research and Advanced Study in Barcelona, Spain, say that there may have been an asymmetry in the early universe between the Higgs boson and its antimatter counterpart, the anti-Higgs. It is thought that the Higgs does not currently have an antiparticle, but the standard cosmological model allows for there to have been both Higgs bosons and anti-Higgs bosons in the very early universe. Tulin and Servant’s idea is that there was an imbalance between the numbers of these particles. The Higgs interacts with ordinary matter, and that imbalance in the number of Higgs and anti-Higgs particles could have translated into an asymmetry in the amount of matter and antimatter.“We really make the Higgs a key player, whereas in many other cosmological theories it's just a by-product,” says Tulin. The team has dubbed the idea Higgsogenesis, after baryogenesis, the name of an early-universe process that has been proposed to create more baryons (particles including protons and neutrons) than antibaryons. “Higgsogenesis is an alternative,” says Tulin. Tulin and Servant show that if the Higgs also interacted with dark matter—for example by generating dark-matter particles when it decays—it could produce a ratio of dark to visible matter that is just what we see in the universe today. Servant says that one consequence of the Higgs interacting in this way would be a new potential test for dark matter, which has so far proven difficult to see directly. When the Higgs decays to other particles in the Large Hadron Collider at CERN, Europe's particle-physics laboratory near Geneva, Switzerland, it would occasionally form dark-matter particles that could not be detected. Higgs decays at the LHC have not yet been studied closely enough to tell whether this is happening, but could be in future, Servant says. Other groups are also pursuing Higgsogenesis. In July, theorist Sacha Davidson of the University of Lyons in France and her colleagues uploaded a paper to the preprint server arXiv investigating what would be required to produce the asymmetry between the Higgs and anti-Higgs that would kick off Higgsogenesis in the early universe. They found that a relatively simple theory—in which the standard model of particle physics includes all the normal particles, as well as two Higgs and one extra, unobservable Higgs-like particle—can produce an asymmetry of the type that Servant and Tulin propose. Two scientists have won the Nobel prize in physics for their work on the theory of the Higgs boson. Peter Higgs, from the UK, and Francois Englert from Belgium, share the prize. In the 1960s, they were among several physicists who proposed a mechanism to explain why the most basic building blocks of the Universe have mass. The mechanism predicts a particle - the Higgs boson - which was finally discovered in 2012 at the Large Hadron Collider (LHC) at Cern, in Switzerland. "This year's prize is about something small that makes all the difference," said Staffan Normark, permanent secretary of the Royal Swedish Academy of Sciences. Prof Higgs is renowned for shying away from the limelight, and he could not be located for interview in the immediate aftermath of the announcement. "He's gone on holiday without a phone," his Edinburgh University physics colleague Alan Walker told the BBC, adding that Higgs had also been unwell. "He is taking a break from all of this, taking some time to relax, because he knows when he comes back he'll have to face up to a media storm." "I am overwhelmed to receive this award and thank the Royal Swedish Academy," he said. "I would also like to congratulate all those who have contributed to the discovery of this new particle and to thank my family, friends and colleagues for their support. "I hope this recognition of fundamental science will help raise awareness of the value of blue-sky research." Francois Englert, 80, said he was "very happy" to win the award, speaking at the ceremony via phone link. "At first I thought I didn't have [the prize] because I didn't see the announcement," he told the committee, after their news conference was delayed by more than an hour. Higgs was born in Newcastle upon Tyne, but it was in Edinburgh in 1964 that he had his big idea - an explanation of why the matter in the Universe has substance, or mass. His theory involved a missing particle in the Standard Model of physics, which has come to be known as the Higgs boson. Within weeks, Francois Englert had independently published his own, similar theory, alongside his now deceased colleague Robert Brout. Three other physicists - Gerald Guralnik, Tom Kibble and Carl Hagen - also made key contributions to the theory, and spoke at the announcement of the discovery of the Higgs boson in 2012. Hagen has long argued for the name of the particle to be changed, protesting at the "rock star" status in which Higgs is held. And Higgs, too, has expressed his discomfort with the attention he has received, preferring to call the particle "the scalar boson". In a statement on Tuesday, Kibble, of Imperial College London, said he was "glad" the Nobel prize had gone to the work of Higgs and Englert. "My two collaborators, Gerald Guralnik and Carl Hagen, and I contributed to that discovery, but our paper was unquestionably the last of the three to be published. "It is therefore no surprise that the Swedish Academy felt unable to include us, constrained as they are by a self-imposed rule that the prize cannot be shared by more than three people. "My sincere congratulations go to the two prize winners, Francois Englert and Peter Higgs." And the renowned physicist Prof Stephen Hawking added his praise: "In the early 60s, theorists were struggling to understand why particles have mass. Peter Higgs and Francois Englert proposed a mechanism called symmetry breaking. 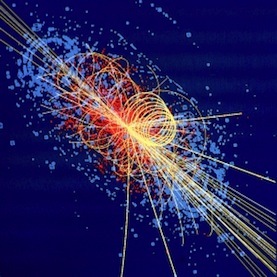 This mechanism also predicted a massive particle, the Higgs boson. The discovery last year at Cern of a particle with the correct properties confirms this prediction and is a triumph for theory." Proving the theory correct took almost half a century and involved creating the biggest and most sophisticated machine humankind has ever built. The LHC at Cern lies in a circular tunnel 27km (17 miles) round. It is so big it is partly in Switzerland, partly in France. It took 10 years and thousands of scientists and engineers to build it. Cern director general Rolf Heuer said he was "thrilled" that this year's prize had gone to particle physics. "The discovery of the Higgs boson at Cern... marks the culmination of decades of intellectual effort by many people around the world," he commented. The Nobel prizes - which also cover chemistry, medicine, literature, peace and economics - are valued at 8m Swedish krona (£775,000; $1.2m). Laureates also receive a medal and a diploma. The official citation for Englert and Higgs read: "For the theoretical discovery of a mechanism that contributes to our understanding of the origin of mass of subatomic particles, and which recently was confirmed through the discovery of the predicted fundamental particle, by the Atlas and CMS experiments at Cern's Large Hadron Collider". David Willetts, UK minister for universities and science, said the award was "an incredible endorsement of the quality of UK science". Prime Minister David Cameron said: "This brilliant achievement is richly deserved recognition of Peter Higgs' lifetime of dedicated research and his passion for science. "It is also a credit to the world-leading British universities in which this research was carried out. "It took nearly 50 years and thousands of great minds to discover the Higgs boson after Prof Higgs proposed it, and he and all those people should be extremely proud."